The best choice I’ve ever made last year was when I decided to get an annual pass for Universal Studios. Btw, if you’re a So Cal resident, you can automatically get an annual pass (with black out dates of course). I’ve only gotten an annual pass one time when I was in college. I went as much as I could but since nothing new really happens in Universal, it got boring. I only go to Universal for Horror Night or when family comes into town but never upgraded to the annual pass. 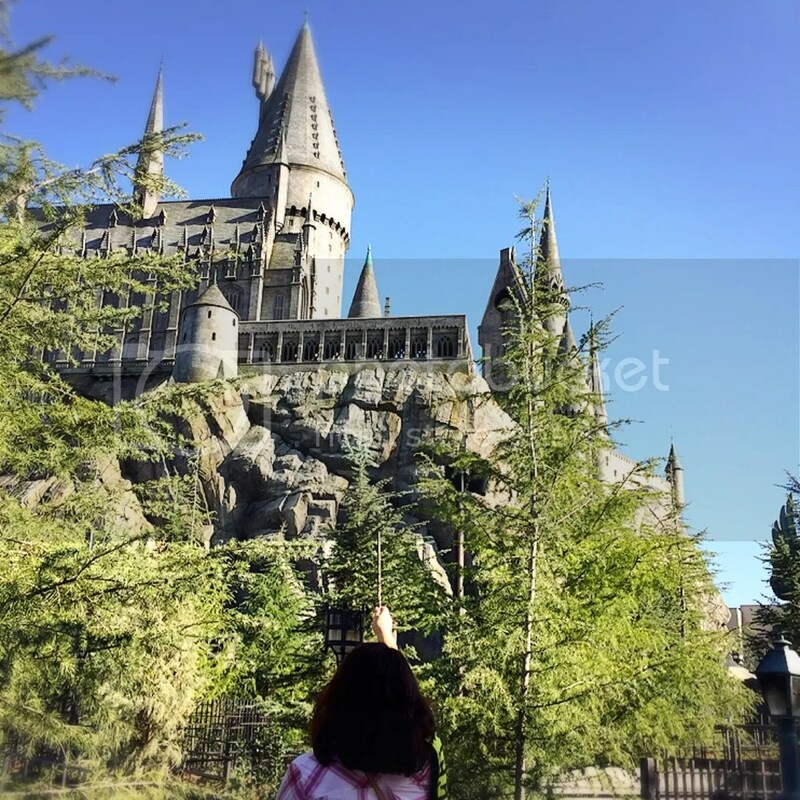 I’ve been to the one in Orlando and I think Hogsmeade is the exact replica (somewhat wider) with the exception of not having The Dueling Dragons roller coaster. I don’t know why they’re having the soft opening if everything is already fully functional lol. I guess it’s because they already announced the opening is April 7 and they don’t want to be blamed for any mishaps before then. Although, I think that the three broomsticks needs a little work for sure! But I’ll get to that later. I actually went two times already. The first time I went, I got there around 2 pm. 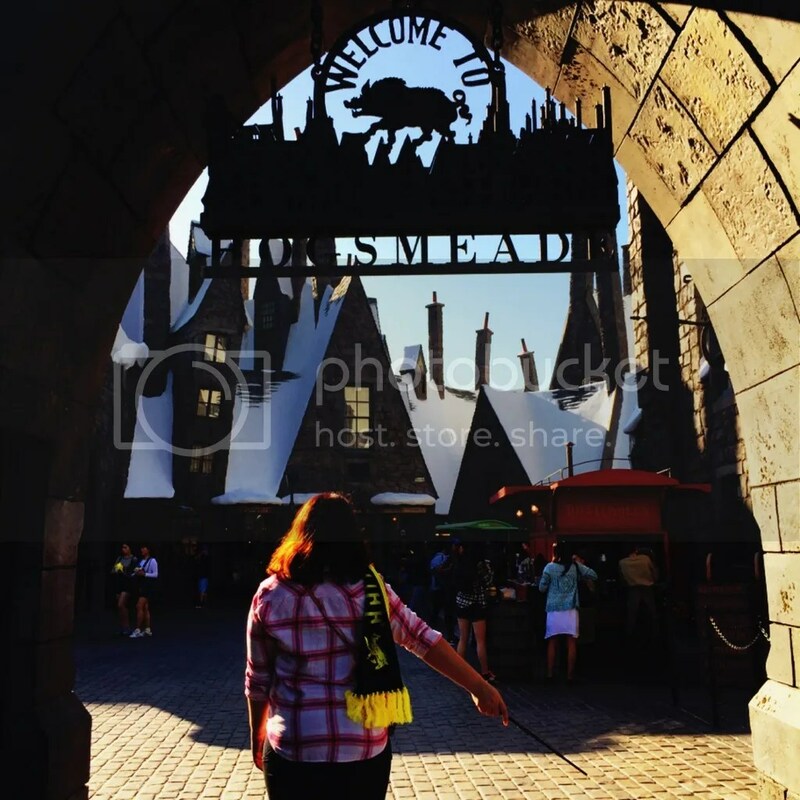 The first thing I wanted to see was Hogwarts, the Forbidden Journey. It was approximately an hour wait. The ride is the same, however, the queuing is a bit different. In Orlando, they have a line for the ride and a line to tour the castle. If you’re a single rider, you go through the line with those touring the castle. In Hollywood, if you want to tour the castle, you have to wait with everybody waiting for the ride. There is a single rider but you pretty much miss the hallway with the talking pictures, Dumbledore’s office, and the Defense Against the Dark Arts classroom. If you have a front of the line pass, you still get to tour the castle but in a faster lane. The stores and the “shows” are the same. They also brought the interactive wands. I think there’s about 11 places where you can “cast spells.” You can use your interactive wands if purchased in other parks or you can purchase at Olivanders. Olivanders was about a 10 minute wait. I heard that they have 2 rooms. By the time I was finished with Olivanders, it was like 4. They weren’t ushering people out, but they closed the front. I saw what I could on the first day as three broomsticks was closed as well (probably when I was at Hogwarts). I took a pic with the Hogwarts express and left and hoping the next time I went, the three broomsticks would be open. Oh! I don’t know if they raised the prices from Orlando but the frozen butter beer and the pumpkin juice was as amazing as I remembered it! I went a second time around the same time but a week or 2 after. 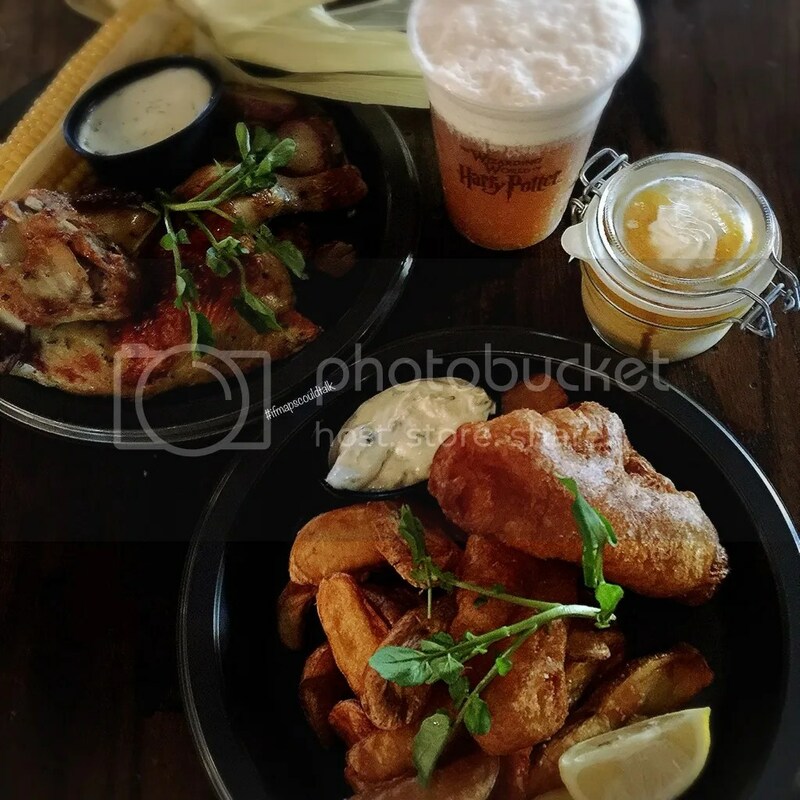 My mission was to eat at the three broomsticks, specifically their fish and chips. The menu is about the same as the one in Orlando. I think they might have added more desserts though. Obviously, with any restaurant, a lot of kinks are needed to be fixed. My friend ordered lemonade and fish and chips but never got it on the bill. Not sure if the guy didn’t hear my friend or he was only listening to one person requesting their order? I can see how he can be confused but I only got my order on the bill and not my friends. No wonder our bill came out to be so cheap the first time! Some of the necessities (utensils and napkins) need to be replenish and utensils need to be at the right spot (I was looking for a fork and got knives instead). We got seated and I was ready to dig in. I took the first bite of the fish and chips and I don’t how it just brought me back to Orlando when I tried it over there. I remembered how much I disliked it lol. The texture isn’t crispy as other fish and chips but it’s just so funny how both places tasted the same. Haha. Also the regular butter beer kept exploding on us. The first time it exploded when we were waiting for the fish and chips so the “server” had to give us a new one. The second time was when I was walking to the table. I don’t know if it’s because there’s a reaction to carbon and the foam but small movements can trigger it. I mean not explode to your face or anything but the foam just starts to expand and overflow to your tray and probably anything in its way. I can’t wait till it finally opens but so glad that I can experience it before April 7! Hope you guys can too! 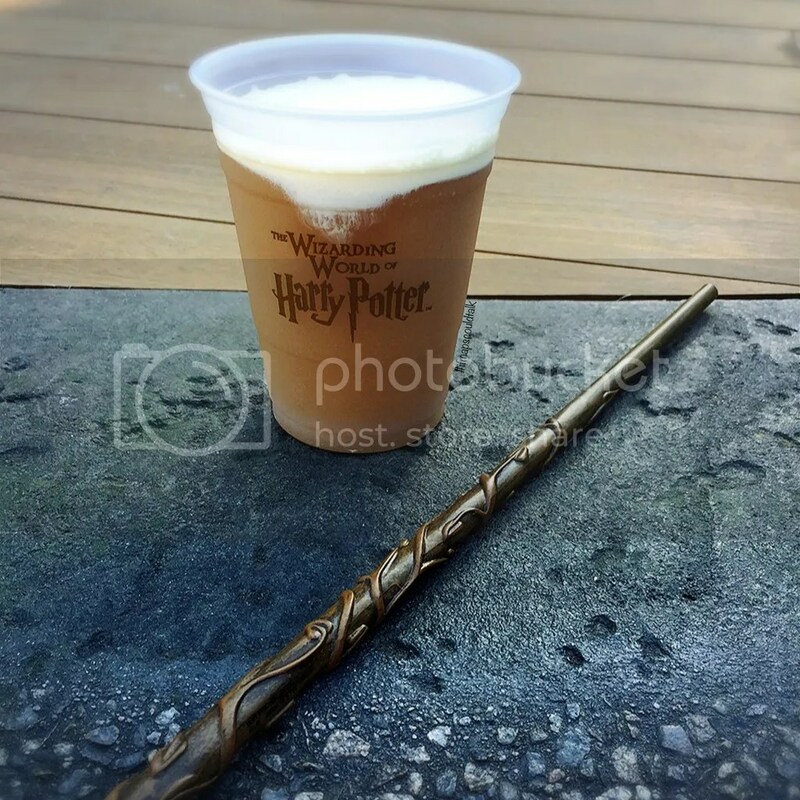 This entry was posted in Events, Hollywood, West LA and tagged Harry Potter, Los Angeles, Universal Studios. Bookmark the permalink.